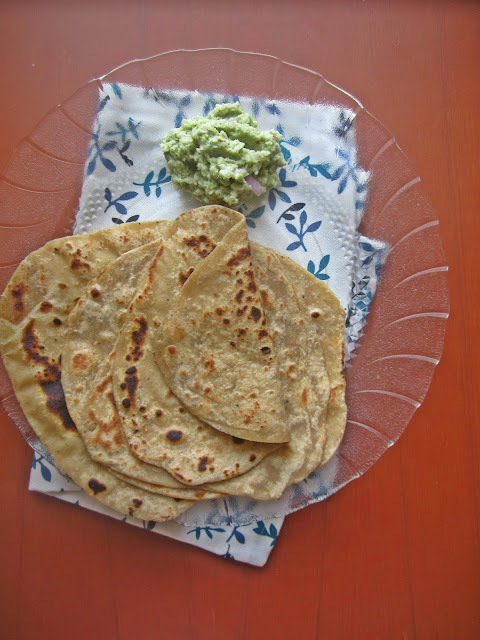 Easycooking: Spiced Chapathi with Coconut Onion Chutney AND a GIVEAWAY!!! Spiced Chapathi with Coconut Onion Chutney AND a GIVEAWAY!!! I still remember the first time Ajay's amma made Chapathi for breakfast when I was a newlywed.Myself being an ardent Chapathi lover,I just couldn't wait to sink my teeth into it and it was smelling awesome.Btw,do you like the smell of chapathi getting done on a tawa?The smell of cooked atta and the ghee put on top of it just make me crave for it more and more. The chapathis were soft and flaky plus sweet and spicy.I was too busy eating them and never asked her the recipe for it.But these are the only chapathis I make at home now.These are delicious on their own and can be had even without any accompaniment.Amma calls it 'Mammama's chapathi' because that's how her amma used to make it. Usually Dal or Bhaji is paired with this chapathi but amma always made a coconut onion chutney and believe me,the pairing is awesome.Never thought a coconut chutney would taste so good with chapathi,talk of North-South fusion! In a mixer jar add banana,green chilly,pepper,sugar and salt and grind to a smooth paste. Add this paste to the flour and add required water to make a soft and smooth non-sticky dough. Coat the dough with oil and let the dough rest for 20 minutes. Roll the dough into small sized chapathis and smear little ghee on top. Fold the chapathi once into a semicircle and then fold again to form a triangle. 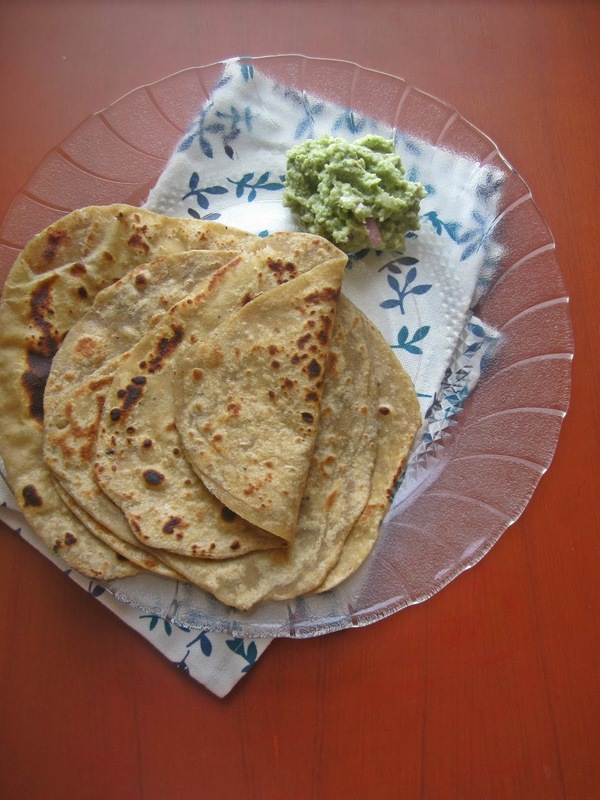 Roll the chapathi not to thick or thin.If you roll it too thick,it wouldn't cook well and if you roll it too thin,it wouldn't be flaky. Cook on a hot tawa till done.One tip which amma gives is that,do not keep flipping the chapathi on the tawa.Once one side is cooked,flip and cook the other,that's it.Apply ghee+oil on top and serve. soft and smooth non-sticky dough. and smear little ghee on top. Cook on a hot tawa till done. One tip which amma gives is that,do not keep flipping the chapathi on the tawa.Once one side is cooked,flip and cook the other,that's it. Apply ghee+oil on top and serve. In a small mixer jar add green chilly,ginger,tamarind,coriander leaves,coconut and salt to taste. Grind to a smooth paste adding just about 2-3 tsp water. Mix in the chopped onions and pulse for 3-5 seconds. Add coconut oil on top. coconut and salt to taste. Folks from Perfico.com were kind enough to send me personalized wine glasses of my choice and have offered to giveaway one set of the same to one lucky reader!! As we are approaching the fag end of Mango season,I decided to make a Mango-Banana Smoothie and serve in these Wine glasses.All you have to do is comment what you would like to serve in these glasses and you could win one set which could be personalized to your choice! Hi thank you very much for posting this recipe and for the giveaway..
Hello divya.....the glasses luk elegant and beautiful....i wud like to serve tender coconut pudding in them divya....thank you..
the spiced chappathy came out great... thanks. We use a similar chutney for uzhunnu vada...good that you are back to blogging divya.